I have to admit I love making jewelry and some of my tools are things that I walk past and a little light goes off in my head and I think I can use that. 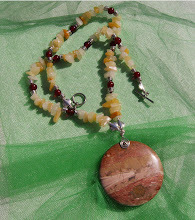 The things that have been very helpful in some of my creations are simple household items. 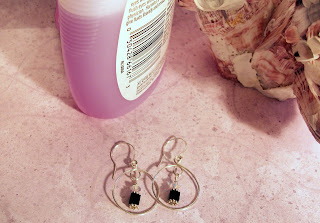 To make these round earrings I used the top of a nail polish bottle, (the cap). I just wrapped the wire around the cap and pulled it tight to size and there I had a design that I could embellish. 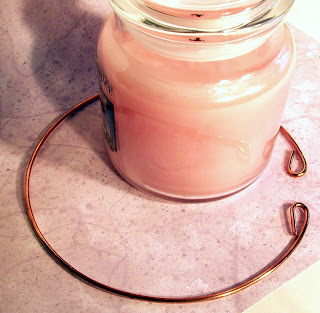 The neck wire was shaped from a candle jar, very gently I formed the circle needed around the glass candle jar, and it made a very nice neck wire. You need to move slowly and carefully when using found items. I can make oval links by wrapping wire around tweezes that I have and then cut the wire and the oval links are formed because of the shape of the tweezers end. My ear wires are made by actually taking the wire and wrapping it around one of the handles of my jewelry tools. I am a bit unconventional at times but I love the feeling I get when I see something take shape. You will find items that you can use if you just look around, I will suggest that you try using copper wire first so that you have practice with that till you get the results that you want before moving on to a more expensive wire. Just wanted to share a creative whim. Neat ideas! It's really clever to use a nail polish bottle to make a ring! Great ideas! You are so creative...love your jewelry too! I'm always amazed by jewelry makers.. lovely etsy shop! Thanks for the tip on oval rings. I like them better than round because they are less apt to slip apart. I've been using pre-made. Now I can try to make my own. Great idea using a candle jar!